The goal was to help Tennessee producers rebuild the beef cattle herd. To do this, UTIA joined with the Tennessee Department of Agriculture and Tennessee Farmers’ Co-op to tackle one of the most costly (and perhaps most critical) components of beef cattle production–replacement heifer development. It’s been one year since the gates officially opened at the Tennessee Beef Heifer Development Center in Lewisburg. The inaugural class of roughly one hundred heifers completed the eleven-month program in September. Another ninety heifers were consigned to the program in October. 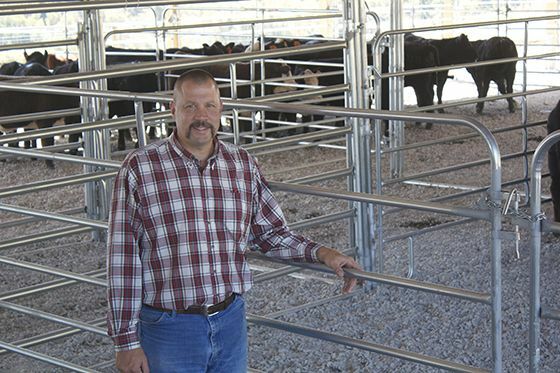 Despite a tough cattle market and crippling drought, Kevin Thompson, director of the UT Dairy AgResearch and Education Center and codirector of the Beef Heifer Development program, says year one was a success. More on the first year and the future in this Q & A. What was your overall impression of the first year of the Beef Heifer Development Center? I think it was a tremendous success. This was a new concept for UT. We wanted to create a model that could be self-sustaining and bring benefit to our clientele, and it did. Having the facility also allowed us to enhance our educational outreach through tours, field days, and one-on-one producer education. We plan to host more educational programs in 2017. What do you think participating producers gained from the experience? We were able to demonstrate the best methods for developing replacement heifers, in an open-to-the-public venue enabling producers to see for themselves the entire process. They learned they can make this part of their operations, which really is the best measure of success. We have multiple producers who came back for year two. I think having repeat consignments shows a good level of confidence in our program. How did the heifers perform? The heifers performed extremely well and producers were pleased with the end product. You’ve collected a tremendous amount of data over the past year. What are you learning from that? First, this data provide economic insights relating to ideal heifer development, resulting in productive and profitable cows. Additionally, the reports convey information helpful to consignors as they try to achieve long-term genetic goals within their herds. Over time these numbers will also help UTIA researchers better understand the dynamics the states’ cow herd and incorporate more effective management recommendations related to genetics, nutrition, health, and reproduction. Along with our project partners at Tennessee Department of Agriculture (TDA) and Tennesee Farmer's Cooperative (TFC), we’ll continue working hard to help the state’s beef cattle producers. We plan to host an educational event this spring in addition to a late summer/early fall field day. We also plan to host a bred heifer sale at the completion of this year’s program.